Popiah - the finished product. Once in a while, my mum would cook a whole pot of finely cut vegetables - turnips, cabbages, carrots with shallots, dried prawns and some meat. All my siblings and I will then turn up for dinner and we'd have the pot of vegetable stew for dinner. I call this our family "popiah party". Popiah, or 薄餅 is the Chinese version of fresh spring roll. You put together some sweet dark sauce, finely ground peanuts, some chilli sauce, slices of hard boiled eggs, some prawns and a lot of stewed vegetables. 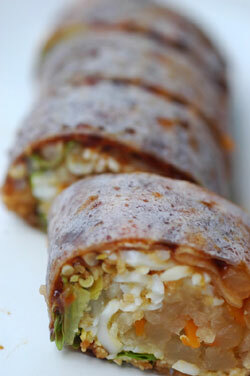 Everything is wrapped in the popiah skin (or 薄餅皮), which is a soft, thin paper-like crepe from wheat flour. My family loves this dish but it takes a lot of effort to make the vegetables since everything needs to be finely cut. The difficult part really is in the cutting because cooking this dish is pretty easy. Just stir fry the shallots, dried shrimps and meat and then throw in all the vegetables and cook on low heat. We had a "popiah party" at home last night. I hope everyone had as good a New Year's Eve dinner as we did. Happy 2012! Popiah is a lot of work! Just the chopping of veggies drive me mad. Thus, I've only cooked popiah ONCE and never again... Yours looked really yummy! Apparently the best ones are handcut till very fine. If you use a shredder, you end up with lots of liquid. Simple and nice dish but really lots of work. Ting - you are right! Shredding results in a lot more liquid! A lot of work! Yummy Popiah!